Good morning! It has been a very busy week here! My son made the school baseball team, woo hoo! My husband is coaching his town team, and my daughter has started softball. Three teams, oh my! I am very ready for April vacation and some relaxation time! The best part is that vacation starts just after Easter. A fun family holiday to start everything off! Speaking of Easter.....we are having an Easter challenge over at Dream Valley this week! What a great segue, huh?! LOL Our sponsor for this challenge is: Mulberry Crafts. One winner will get a goody bag! For my card I have used Bugaboo stamp Scene it Easter. I colored this with copics, the brightest and most colorful that I had! The paper is from Basic Grey - Sweet Threads, and the sheer ribbon is some I had in my stash. Have a great week and don't forget to play in our challenge at Dream Valley! This is so sweet, Kendra. I love that magnificent bow! I guess I have to wear two DT hats today and thank you for playing along in the challenges at both Doodle Garden and Open-Minded Crafting Fun. Good luck in the draws. Gorgeous!! Great coloring... Love that bow too!! Thanks so much for playing along with us for Animal Antics at Open-Minded Crafting Fun Challenges!!! Good Luck! I hope we see you again!! This is too cute!! I love the image and your coloring.Thanks for joining us at Simply Create Too! Hi, Kendra, Beautiful Easter card. I love your cute digi. 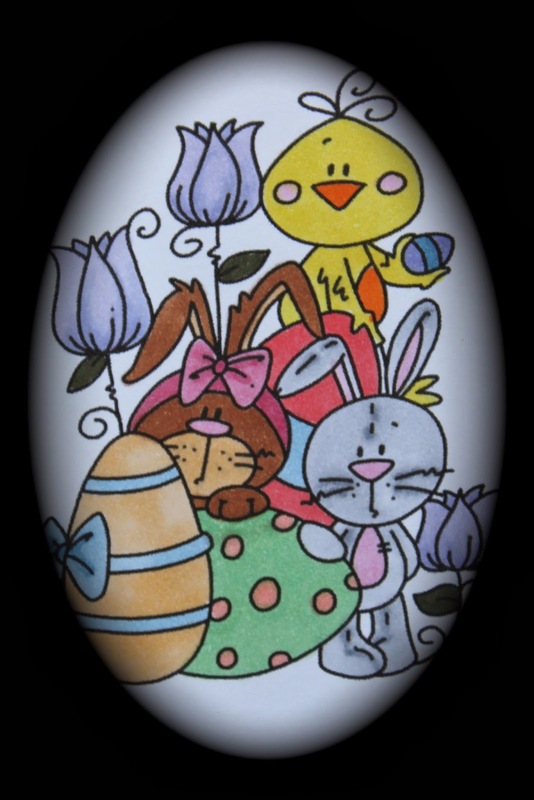 Thank you for entering our Easter/Bunny Challenge at Simply Create Too. Our new challenge starts this coming Friday and we hope you enter it too. ahhhh such a cute card! Totally adore that big bow that you have added. Such a sweet Easter card. Love the coloring and design. Your bow finishes it off perfectly! Thank you for joining us at Open Minded Crafting Fun Challenges. Wonderful card, I like the darling bugaboo images and your coloring is great. Thanks for joining us at Catch the bug for our ATG challenge.